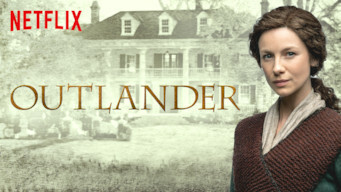 How to watch Outlander: Season 3 (2017) on Netflix United Kingdom! Sorry, Outlander: Season 3 is not available on British Netflix, but you can unlock it right now in the United Kingdom and start watching! With a few simple steps you can change your Netflix region to a country like South Africa and start watching South African Netflix, which includes Outlander: Season 3. We'll keep checking Netflix United Kingdom for Outlander: Season 3, and this page will be updated with any changes. Outlander: Season 3 is not available in United Kingdom BUT it can be unlocked and viewed! This epic tale adapted from Diana Gabaldon's popular series of fantasy-romance novels focuses on the drama of two time-crossed lovers. She's a modern woman trapped in a brutal past. And the path to escape is riddled with dangers -- and unexpected desires. Season 1 of Outlander has 16 episodes. Because different Netflix countries have different availability for episodes, you'll need to check the episode listing below to see which are available in the United Kingdom. While on a second honeymoon in Scotland, former army nurse Claire stumbles on a gateway to the past and falls in with a band of Highland rebels. Claire arrives at the MacKenzie clan's castle and finds herself under suspicion from all sides. Jamie reveals a dark chapter from his past. Claire tries to embrace her role as healer but bristles at the harsh customs of the time -- and makes a powerful enemy of a local priest. As the clan prepares for an important gathering, Claire plots an escape from the castle. New tensions surface between Jamie and Dougal. On the road with Dougal and his men to collect rents, Claire encounters troubling scenes and begins to suspect a hidden scheme. Claire enjoys a warm welcome at a British outpost. But the arrival of a familiar face sours the mood and puts her in an uncomfortable position. Claire wrestles with feelings of guilt as she and Jamie take a big step to keep Captain Randall at bay. Frank grows desperate in his search for Claire. Meanwhile, Claire and Jamie set out in search of a witness who may be able to clear Jamie's name. Sparks fly as Jamie confronts Claire about her trip to the stones. More trouble awaits the pair back at Castle Leoch. 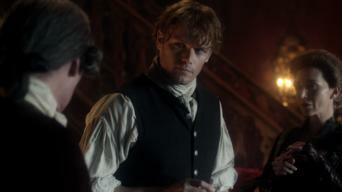 The arrival of a duke raises Jamie's hopes and Claire's suspicions. Meanwhile, Claire confronts a rival and sees a troubling new side of Geillis. 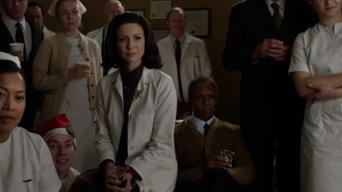 Claire discovers that Geillis may have another startling secret as they go on trial before an angry crowd. Later, Claire faces an agonizing decision. Jamie takes Claire to his ancestral home, but long-simmering family tensions cast a cloud over their arrival. The family scrambles to conceal Jamie's true identity from the members of the Watch. When Jenny goes into labor, Claire tries to ward off a crisis. On a quest to find Jamie, Claire begins traveling the countryside as a performer and strikes a deal with Dougal. Claire and the others race to find a way into the prison, only to discover that Randall is there seeking his own twisted form of vengeance. 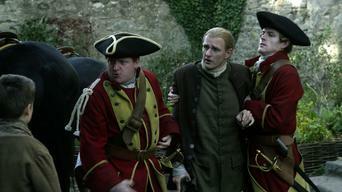 The men try one last ploy to free Jamie. But his encounter with Randall takes a heavy toll and leaves Claire grasping for answers. Season 2 of Outlander has 13 episodes. Because different Netflix countries have different availability for episodes, you'll need to check the episode listing below to see which are available in the United Kingdom. Claire's worlds collide when she wakes up at the stones in 1948. Back in 1745, Claire and Jamie arrive in France and quickly earn a new enemy. In Paris, Jamie wrestles with his demons and obtains an unexpected audience with Prince Charles. 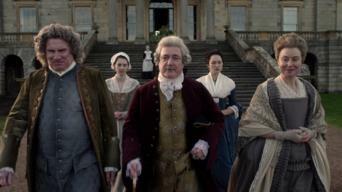 Claire makes a troubling discovery at Versailles. As Jamie wades deeper into backroom politics, he discovers Prince Charles is keeping secrets from him. Claire finds a new use for her skills. Claire finally tells Jamie what she's been hiding, with surprising results. An evening designed to embarrass Prince Charles takes a chaotic turn. Charles puts Jamie in an uncomfortable position, Claire intervenes in a delicate relationship, and a chilling encounter brings the past roaring back. Claire and Jamie move forward with the smallpox scheme and decide to let someone else in on their secret. A broken promise brings dire consequences. After an agonizing ordeal at the hospital, Claire sets out to win Jamie's freedom and finds herself in a delicate dance with the king. Back in Scotland, Claire and Jamie take a new approach to the rebellion. 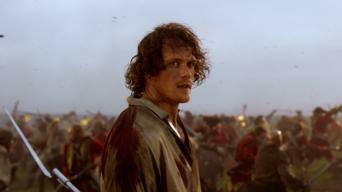 But their plan stirs up tensions with Jamie's grandfather and Clan MacKenzie. As Jamie trains his motley band of men to fight, Claire is haunted by memories of World War II. A power struggle with Dougal threatens the mission. Squabbles among the prince's advisers bog down the rebellion -- until a tip from a local reveals a way to catch the British off guard. A sudden change of plans sends Claire and the Highlanders north, toward fresh trouble and an unexpected reunion. While Jamie races to steer the Jacobites away from Culloden, Claire tends to an ailing Alex Randall and faces a weighty request from Colum MacKenzie. 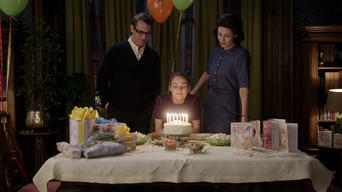 Long-buried secrets begin to emerge as Claire and her daughter visit Scotland in 1968. 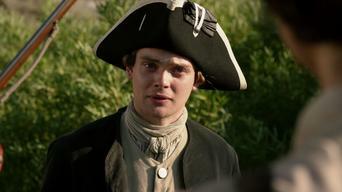 Back in 1746, Jamie takes drastic steps to save his loved ones. Season 3 of Outlander has 13 episodes. Because different Netflix countries have different availability for episodes, you'll need to check the episode listing below to see which are available in the United Kingdom. Waking to a grim scene at Culloden, Jamie slowly pieces together his memories of the battle. Claire settles uneasily into her new life in Boston. Six years later, a broken Jamie hides out in the woods as the redcoats hound his family. Claire tries to make good on her promise of a fresh start. As Brianna grows older, fresh cracks appear in Claire and Frank's marriage. Meanwhile, Jamie forges a tentative alliance with a new prison warden. Jamie navigates a dizzying string of complications at the Helwater estate. In 1968, Claire and Brianna search for clues to his life after Culloden. As Brianna struggles to readjust to life back at Harvard, a surprise visitor arrives for Christmas -- with news that leaves Claire reeling. Passions and nerves run high as Claire steps into a printer's shop in Edinburgh for a moment decades in the making. A crisis forces Claire to put her medical training to use and sends Jamie scrambling to cover his tracks. Fergus helps Ian make a romantic connection. Claire returns to Lallybroch, only to discover she's not as welcome as she once was. Jamie pays the price for keeping a secret too long. As Jamie and Claire set sail on a rescue mission, life at sea proves full of turmoil, superstition and surprises. While racing to stop the outbreak aboard the Porpoise, Claire makes a troubling discovery. A request from Jamie puts Fergus in a bind. Washing ashore on an unfamiliar island, Claire battles the elements as she searches desperately for signs of civilization -- and a way back to Jamie. In Jamaica, Ian finds himself at the mercy of a mysterious figure. 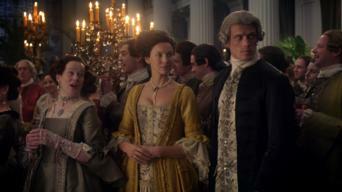 The Frasers attend a lavish ball at the governor's home, where surprises abound. At Rose Hall, Claire slowly realizes what Ian's captor is really after. A showdown takes shape at a cave rumored to have supernatural properties. Season 4 of Outlander has 13 episodes. Because different Netflix countries have different availability for episodes, you'll need to check the episode listing below to see which are available in the United Kingdom. Four months after arriving in America, Jamie and Claire bid farewell to a friend, cross paths with a pirate and weigh an offer from a governor. Jamie's Aunt Jocasta welcomes the weary travelers to her lavish plantation, where Claire's views on slavery soon stir up trouble. Claire and Jamie head into the mountains, where bad weather makes for a dramatic night. Sparks fly when Roger and Brianna meet up for a festival. As the Frasers start work on their new home, unsettling encounters put them on edge. Roger calls Brianna to share a big discovery. While helping deliver a baby, Claire becomes caught in a bitter dispute. Jamie gets a big surprise when he travels to town to recruit new tenants. A pair of unexpected visitors bring Jamie's memories of Helwater rushing back -- and stoke tensions at Fraser's Ridge. After an unlucky start to her journey, Brianna finds refuge with someone who knew her father well. Meanwhile, Roger embarks on an odyssey of his own. As Roger searches the streets of Wilmington for Brianna, Jamie and Claire attend a play with Governor Tryon and learn of a troubling plan. Shaken by her ordeal, Brianna prepares to leave town. 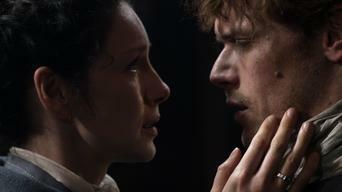 But news of Claire's feat at the theater upends her plans -- and leads to an emotional reunion. Brianna grows closer to Jamie as she weighs a decision about her future, but a shocking revelation soon tests their bond. Roger faces a grueling trek. At River Run, a dinner party for a visiting lord puts Brianna in an awkward position. Meanwhile, Murtagh and Fergus hunt for Bonnet. News of Bonnet's fate draws Brianna and John to Wilmington. Roger befriends a fellow captive. 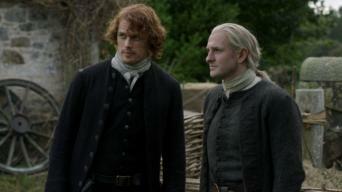 Fergus and Marsali hatch a risky plan to help Murtagh. Jamie, Claire and Ian reach the Mohawk village, but their bid to buy Roger's freedom goes awry. At River Run, Brianna prepares for the baby's arrival.